I’ve been chatting with hardware startups who are looking for a production partner. The topic of offshoring and rightshoring came up. Should they manufacture in the US, or abroad? What is right for their product and stage of business? How do they make this decision? I’ve had a lot of discussion with Adam Shayevitz, a highly experienced strategic sourcing consultant, about this topic. I thought I would share some of what I’ve learned from Adam as well as from personal experience. Off-shore manufacturing used to be the de-facto choice for any hardware startup aspiring to achieve a healthy gross margin. The cost of goods sold (COGS) for offshore manufacturing always looks attractive. In recent years, however, there has been a lot of dialog about whether this make sense for everyone and everything. The short answer is that it doesn’t. My personal experience tells me that there is no one-size fits all strategy. However, there are factors that will significantly impact the onshore/offshore manufacturing decision. The most important factor is the relationship between the production volume and the value of the product. 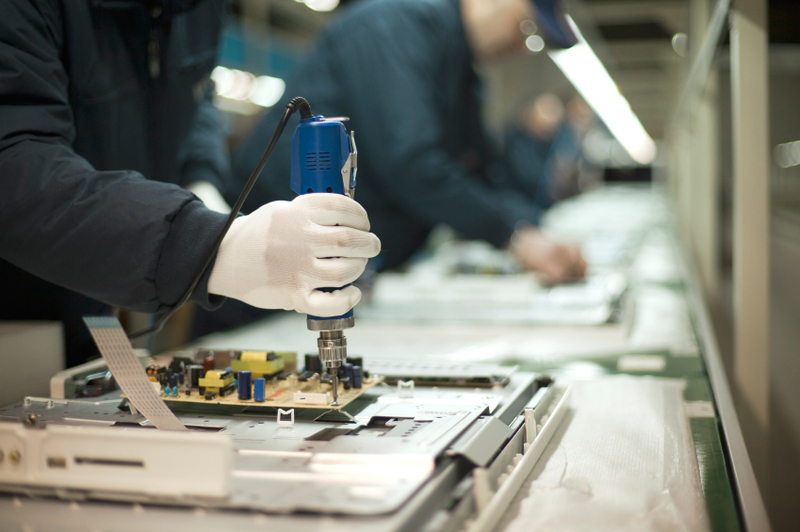 Are you creating a low value, high volume product (such as a consumer electronics product)? Is your total cost of goods under $50? Are you ready to commit to making at least 10,000 of your product in the first year of production? If so, then offshore manufacturing is probably the right path. On the other hand, if you are creating a high value, low volume product (such as a medical device) with a healthy COGS (e.g. $1000) and a relatively low volume (e.g. 5000 a year for the first year of production) then you should seriously look into manufacturing in the USA. A second factor is the level of intellectual property protection you are looking for. Are you working on a government contract? If so, you are definitely manufacturing in the US. You may have to choose a CM who is a certified defense contractor, where everyone on staff is a US citizen with security clearance. That is an extreme case, but if you have IP you are looking to protect, you may want to rethink offshoring. Case in point: an exact replica of one of my prior products popped up in Asia a few years after we started producing them in Southern China. Somebody somewhere leaked the technical package. There wasn’t anything anyone can do about this, since IP laws are not exactly enforceable in China. If this is a significant concern, manufacturing in the US will give you much better peace of mind. A third factor is the precision and level of invention needed in process development. Does your product have lots of moving parts? Do you need high precision parts? If the answer is yes, then process development is a lot more significant. The counterexample is commodity products like laptops and mobile phones. These involve fully validated and low risk manufacturing processes. Developing and honing a complex production process is far more easily done if the CM is close to the R&D center. As a general rule of thumb, military products (usually made in low volumes) need to be made in the US. 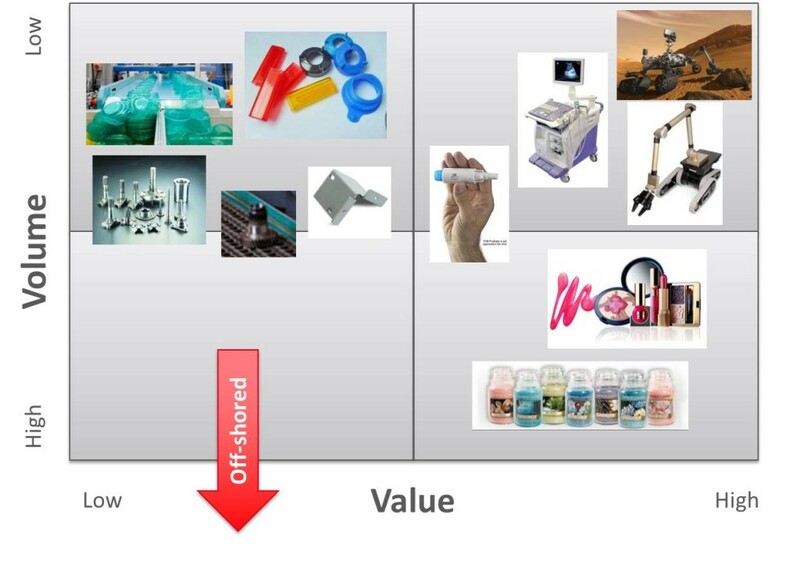 High value products such as medical devices and luxury goods (made at any volume) are comfortably producible in the US. Low volume, low value products are suffering. While making these products in the US makes the most sense, it is hard to get the COGS to an acceptable level. This is because much of the cost is in the setup of the manufacturing line. This is often a fixed cost regardless of quantity of products made. At low volumes, this setup cost gets passed on to the startup in the form of a higher COGS, significantly impacting their gross margin. Not having existence proof of a viable COGS makes it very hard to derisk a device sales based business model, which only works at scale. This is a very interesting problem, with several groups working on solutions in the US and in Asia. It will be interesting to revisit this issue in a couple of years to see if things have improved. Another issue with startups looking to manufacture their first products is a business model mismatch with their CM. The startup is looking to move very fast, experiment and fix issues quickly. They would want to produce in small lots and iterate as they go. The CM model, however, values stability of the product and works best with large runs of a mature, stable product. Due to this mismatch, CMs often find that they lose money on startup deals. Startups often don’t have a credible credit record, and are not good at making their production forecasts. Their volumes are lower, and their products are less proven, resulting in greater risk for low yield or catastrophic stop-ship events in the first year of production. The CM has a much easier time dealing with mature companies and products. When push comes to shove, the CM often end up prioritizing their big customers over their startup customers. They could become very non-responsive to the needs of the startups. While this is true of all CMs, this seems to happen much more in Asia, where more large scale manufacturing is going on. In the worst case scenario, the CM could decide that they are losing money and proceed to “fire” the startup from its customer base. Since most startups are single-sourced to their supply base, this could be a huge challenge. This has happened to several startups I know. It’s not pretty when it happens. An interesting way to tackle this transition is to work with multi-national suppliers. These companies have a presence in the US and multiple locations off shore. This allows you to start manufacturing in the US at a higher COGS level, and transition within the same supplier to an offshore facility if and when your volumes and business model supports this move. That way, you can have the best of every world: flexibility while you are developing a new product, and a cost-competitive COGS when you are producing at scale. Special thanks to Adam for educating me on the multi-national strategy and many other issues.